Maurice Dupuy, Paris (acquired from the Alexis Rudier foundry circa 1935). By descent to the previous owner (circa 1963). G. Grappe, Catalogue du Muse Rodin, Paris, 1944, no. 56 (large plaster version illustrated, p. 24). H. Martinie, Auguste Rodin, Paris, 1949, no. 19 (another cast illustrated). A.E. Elsen, Rodin, New York, 1963, pp. 52-57 (large bronze version illustrated, p. 54). R. Descharnes and J.-F. Chabrun, Auguste Rodin, Lausanne, 1967, p. 74 (large bronze version illustrated). I. Jianou and C. Goldscheider, Rodin, Paris, 1967, p. 88 (another cast illustrated, pl. 11). J. de Caso and P. Sanders, Rodin's Thinker, Significant Aspects, Burlingame, California, 1973, pp. 1-30 (large bronze version illustrated, pls. 1-6). J.L. Tancock, The Sculpture of Auguste Rodin, Philadelphia, 1976, pp. 111-120, no. 3a (large bronze version illustrated, pl. 113). J. de Caso and P. Sanders, Rodin's Sculpture, A Critical Study of the Spreckels Collection, San Francisco, 1977, pp. 131-138 (another cast illustrated). A.E. Elsen, Rodin Rediscovered, Washington, 1981, pp. 66-67 (another cast illustrated, p. 67). A.E. Elsen, Rodin's Thinker and the Dilemmas of Modern Public Sculpture, New Haven, 1985 (another cast illustrated). A.E. Elsen, The Gates of Hell by Auguste Rodin, California, 1985, pp. 71, 73 and 74 (clay version illustrated, p. 56, fig. 50; p. 58, fig. 52; p. 71, fig. 60). C. Lampert, Rodin Sculpture and Drawings, London, 1986, pp. 24 and 205, no. 74 (another cast illustrated, p. 25, pl. 44). P. Kjellberg, Les bronzes du XIXe sicle, dictionnaire des sculpteurs, Paris, 1987, p. 582 (another cast illustrated). R. Butler, Rodin, The Shape of Genius, New Haven, 1993, pp. 422-431 (small plaster version illustrated, pl. 63; large plaster version illustrated, pl. 175; large bronze version illustrated, pl. 177). Le penseur was conceived circa 1880 for the center of the tympanum of Rodin's La porte de l'Enfer. He later explained the genesis of his project: "The Thinker has a story. In the days long gone by, I conceived the idea of the Gates of Hell. Before the door, seated on a rock, Dante, thinking of the plan of his poem. Behind him, Ugolino, Francesca, Paolo, all the characters of the Divine Comedy. This project was not realized. Thin, ascetic, Dante separated from the whole naked man, seated upon a rock, his feet drawn under him, his fist at his teeth, he dreams. The fertile thought slowly elaborates itself in the brain. He is no longer dreamer, he is creator" (A. Elsen, op. cit., 1963, p. 53). Rodin expressed his own thoughts directly in a plastic medium and thus it is no surprise that he aimed to combine within Le penseur the attributes of both physical and mental acumen. This monumental figure, possibly his most celebrated work, was discussed by the sculptor shortly before his death, where he stressed the physicality and the vitality and power of the creative mind: "Nature gives me my model life and thought; the nostrils breathe, the heart beats, the lungs inhale... the being thinks and feels... What makes my Thinker think is that he thinks not only with his brain, with his knitted brow, with his distended nostrils and compressed lips, but with every muscle of his arms, back and legs, with his clenched fist and gripping toes" (Saturday Night, Toronto, December 1917). Le penseur belongs to the group of major early works inspired by Michelangelo, whose sculpture had greatly impressed Rodin on his visit to Italy in 1875. 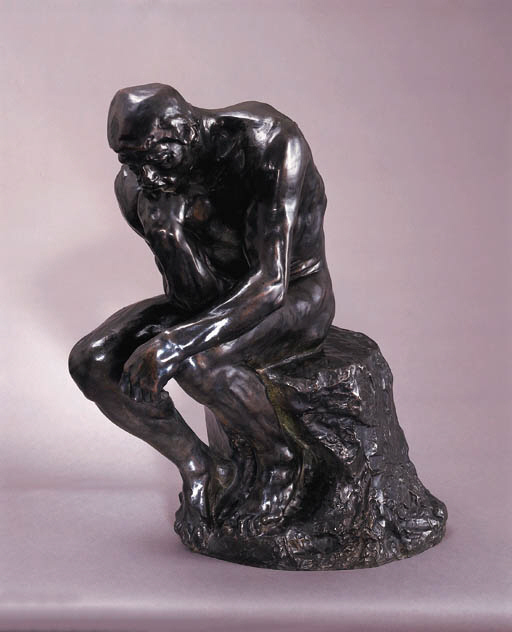 Rodin soon considered Le penseur to be valid as an independent work and exhibited it on its own in Copenhagen in 1888.